The last time logs were driven down the Kennebec River was in 1976. Pulpwood, cut in the headwaters of the Moosehead Lake region, was driven downstream to the Scott Paper Company plant at Winslow. Thirty-four years later there remain signs of the past, although they can be subtle. This log was stuck in the mud of a back eddy located in the Kennebec near Solon. Close inspection reveals that both ends are sawn even. Although it's hard to tell in the picture, the log is just about 4 feet in length. It's most likely a piece of spruce or fir, since only softwoods were driven down river because of their buoyant characteristics compared to hardwoods. It's a piece of pulpwood that is at least 3 decades old. Millions of these 4 foot logs were driven down the river for over 170 years from the early 1800's until 1976, and they can still be found today. My dad, who grew up on the banks of the river in the 1950's, tells stories about collecting stray wood with his friends that would lodge on the banks. They would stack the wood in a pile 4 feet high and 8 feet long (and 4 feet wide per the cut length- which makes one cord) and resell the wood to a timber buyer from the paper mills in Augusta. I guess the paper guys could have just taken the wood since it was really theirs anyway, but my guess is they appreciated the efforts of a band of industrious 10 year-olds who probably imagined themselves a bunch of salty north woods river drivers as they salvaged that wood and stacked it for the mill man. 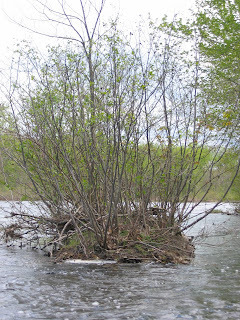 This is a rectangular island below a braid on the Solon stretch of the river. Nature doesn't make square islands. It's actually a cribwork structure, made of logs and filled with river rocks. These were used to divert logs into or away from different areas. 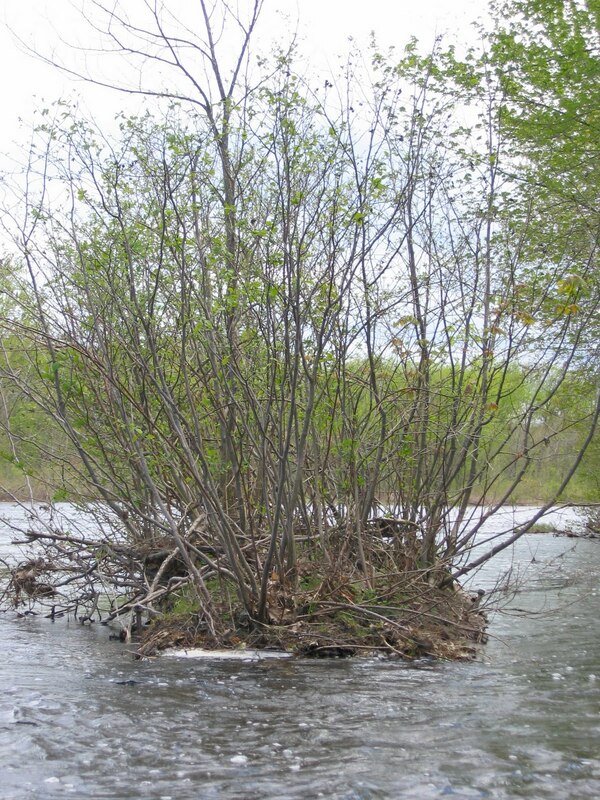 In this case the cribwork was likely used to keep logs out of a side channel off of the river's main stem. These days it acts as a nice structure for the trout that live here to escape the currents and collect food, like this brown. Chris and Todd and I floated Solon, and it was a blast to fish with these guys. They were catching fish and stoked to be doing it. Here is Chris with a nice brookie that ate a black bugger. This is a shot of Todd, who was super-psyched to complete a Solon tri-fecta with a brookie, salmon, and this little brown who made three charges and swipes at his streamer before he ate it. He put on a show, and we had a great view of the action from our vantage in the boat. A little brown with that kind of gumption has the potential to grow up and become one of the big boys that make this stretch so much fun to fish. Water temps were hanging in the mid-40's with good flows. The big hatches of Hendricksons and caddis should kick off in earnest any day now as water temps approach the magic 50 degree mark.